After arriving in Tehran from Imam Khomeini International Airport (IKA) our professional tour guide will meet and greet you then you will be transferred to hotel for rest. In the afternoon, you’ll go to see National Museum of Iran which is an institution formed of two complexes, including the Museum of ancient Iran and Islamic Era. Tonight’s dinner in a local restaurant offers a chance to experience daily Iranian life in Tehran. At night we go to Tehran Nature Bridge where Tehran young couples spend time together. Tonight’s dinner in a vegetarian restaurant of the Iranian Artists Forum offers a chance to experience young artists life in the capital of Iran. We meed some of Iranian art students spend time with them. Leaving Tehran behind, we’ll travel south to Kashan to visit Bagh-e Fin Garden. This very early Persian garden reflects ancient landscaping principles that trace their roots to the time of Cyrus the Great in the 6th century BCE. Today, it’s a delightful setting where you can meet young Iranian families who are out to enjoy their day. You’ll also visit the historic Borujerdi House here in Kashan. With fine decorative motifs handcrafted of stucco, impressive domes, wall paintings and inlaid mirror mosaics, this former merchant’s home is regarded as a masterpiece of traditional Persian architecture. It also boasts 130-foot tall wind towers to catch lofty breezes that can cool the entire house. 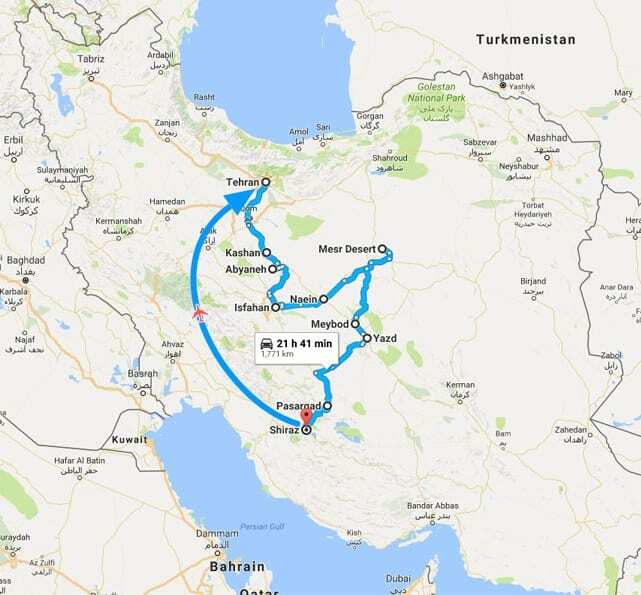 Your overland journey continues to Isfahan. As the 17th-century capital of the Safavid Empire, Isfahan was one of the world’s greatest cities – architecturally striking, wealthy beyond imagine, and politically powerful with Europeans, Ottomans, Indians and Chinese coming to its court – the heart of a vast Persian Empire that stretched from the Euphrates River in present-day Iraq to the Oxus River in Afghanistan. Indeed, its grandeur inspired the rhyming proverb, Isfahan nesf-jahan (Isfahan is Half the World). You’ll join our expert guide to begin your exploration of the city, starting with some of the centuries-old, still elegant bridges that span the Zayandeh River. Leaving Isfahan behind, your first stop this morning will be in Na’in, an ancient community with origins dating back to the 8th century. At the local Ethnographic Museum, set in an erstwhile private residence of the Safavid era, you’ll learn more about the region’s cultural traditions. We’ll continue the way to Farahzad village where is beautifully located on the edge of the sand desert and makes your stay especial since most other places in that region have some distance from the real desert. In that place you’ll have the chance to visit the historic villages and stay with local people enjoying their homemade food, become familiar with their customs and ways of life. At Zendan-e Eskandar, you’ll find an ancient domed structure with a deep, circular brick-lined pit that resembles a dungeon. According to legend, the complex was built by Alexander the Great to hold prisoners during his conquest of Persia. Others believe it was constructed by the Persians to hold Alexander himself. Among the many other historic sites to be seen in Yazd are beautiful old homes and the Dowlat Abad Garden. Standing by the garden’s long reflecting pool, you’ll be shaded by ancient cypress trees. Ahead of you is an 18th-century hexagonal pavilion with a beautiful stained glass window and a graceful wind tower – the tallest in Iran. All around are flowering fruit trees and other ornamental plants and trees. Later, you will arrive to Shiraz. In Shiraz, you’ll visit the lovely garden tomb of Sa’adi and tomb of Hafez, two of our most outstanding poets to feel the taste of Persian Literature. Hafez is one of great poets who impressed everyone with his mastery. His poems give us a special feeling and the peace in his tomb is really outstanding. Sa’adi is a poet, philosopher and mystic who is known as the father of an alternative tourist. About seven previous centuries he travelled to different countries and cities. Then he collected all his experiences in verse and Rhyme prose in two books named Boustan and Golestan. These two books give you Lots of inspiration and information. We will get a chance to pay homage to tombs of these great poets. After breakfast, will start your full day tour of Shiraz. It is the best time to communicate and exchange information with each other about everything in addition to visiting many sites. At first, you will visit Eram Garden with its aromatic myrtles, beautiful flowers, fruit trees, and towering cypress (one of which is said to be 3,000 years old). You will also visit Karim Khan Citadel. Built during the Zand Dynasty. After that, you will visit Nasir-al-Mulk Mosque (Pink Mosque). It built by the order from one of the lords of the Qajar Dynasty, Mirza Hasan ‘Ali Nasir-al-Mulk, it took 12 years to complete in 1888. Its interior reveals a magnificent masterpiece of design with stunning colors. This is a space where light and worship intertwine. The mosque comes to life with the sunrise and colors dance throughout the day like whirling dervishes. It reflects on the ground, walls, the arches and the towering spires. It even reflects on the visitors as if a colorful ball is hit by the first sun ray and explodes to thousands of butterflies all around. You’ll be escorted to the Shiraz Airport this morning for your departure flight to Tehran. After arriving in Mehrabad International Airport our tour guide transfer you to the hotel. In the afternoon, you’ll visit Milad Tower which is a multi-purpose tower in Tehran, Iran. It is the sixth tallest tower and the 17th tallest freestanding structure in the world and you will end your day exploring at Azadi Tower (Tower of Freedom) formerly known as the Shahyad Tower is a monument located at Azadi Square, in Tehran City, Iran. It is one of the symbols of Tehran. Meals: 15 breakfasts, 0 lunches, and 1 dinner.